At Unfinished Furniture Expo, we’re thrilled to feature the gorgeous McKenzie collection from Whittier Wood Furniture. With a range of offerings that are perfect in the living room, dining room, bedroom, or home office, our McKenzie furniture is sure to add a touch of class to your home. There are some genuinely stunning items that will slot perfectly into your dining/living room design. 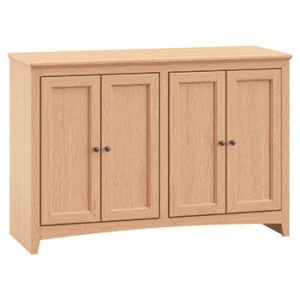 One of our favorites is the 48-inch wide McKenzie Alder Cabinet. Available in nine different color finishes – including the natural unfinished option – it’s the ideal cabinet for storing plates, glasses, and any other things in your dining room. Or, it goes wonderfully as a sofa back table to add something to your living room. While perfect on its own, this piece can be combined with the beautiful 48 x 48 inch Alder McKenzie Bookcase. The two together will create a striking look that brings a traditional rural sense to your dining room. The bookcase alone will look ideal in both dining or living areas and can be filled with your favorite books or ornaments. The McKenzie Collection by Whittier Wood Furniture has a range of beautiful bedroom pieces. Add the 1100 3 Drawer McKenzie Nightstand beside your bed, so you have somewhere to store your socks and place a night lamp. 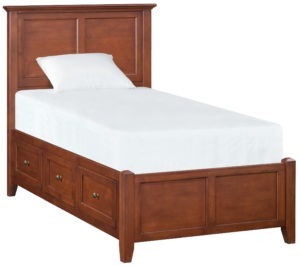 Like all McKenzie furniture, it’s made out of high-quality wood that’s built to last. If you want to upgrade your storage space even more, then the magnificent 12-Drawer McKenzie dresser is the ideal option. Speaking of storage, you can relax on a grand 1300GAC McKenzie Twin bed that comes with storage compartments underneath. If you need something a little bigger, then 2346 Queen Mantel bed is right up your street. Both are available in Glazed Antique Cherry or Caffe finishes, adding a glossy look to your bedroom. There are so many more dressers, bedside tables, and beds to choose from as well. So, make sure you check out the full collection on our site. If you have a home office or study area in your home, then the McKenzie collection can help you upgrade it with some of the finest wooden furniture around. The 2400 3-Drawer Desk is available in two different colors and gives you the perfect space to work for hours on end. Combine this with the lovely 688 Hawthorne Office Chair, and you have a classy work area. There’s even an elegant 2407 Writing Desk that has a roomy drawer underneath the high-quality Alder Wood plank top for added storage. No matter what room you’re trying to reinvent, Unfinished Furniture Expo can offer a range of quality furnishings from the McKenzie Collection. Take a look at all the option on our site, and pick out the pieces that you love the most.